Supported Polypropylene styles have excellent cold temperature flexibility, long term UV resistance, and substantial tensile strength. Layfield's supported styles of Polypropylene [PP (S)] combine the unique attributes of the PP polymer formulation with the mechanical strength of a 250 lb polyester scrim. PP (S) brings together two soft, supple PP films laminated onto a reinforcing scrim layer. 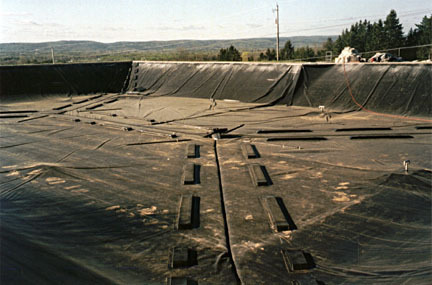 The resulting geomembrane is strong enough to hang vertically in the form of a baffle curtain or tank liner, and durable enough to leave exposed to the elements for many years. PP(S) is UV stabilized with 2 to 3% carbon black included in the formulation. This polymer is resistant to surfactants which can cause environmental stress cracking in HDPE. PP (S) maintains it's flexibility at low temperatures, making severe winter installations or service conditions an easy application to resolve. CSPE is an excellent floating cover and lining material with one of the best weathering warranties available. The long-term success of a containment is often attributable to the attention spent on maintenance. Our Safety-Blast hole liners improve the performance of explosives in open pit mines.